IRELAND U17 GOALKEEPER Jimmy Corcoran has thanked his team-mates, friends, family and ‘so many in the sporting world’ for their support after the cruel manner in which he and his side were eliminated from the Euros on Monday night. 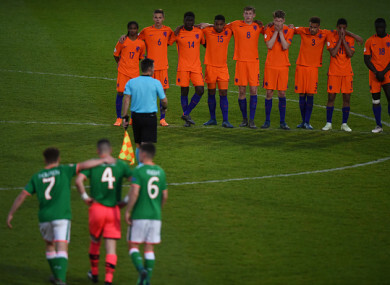 Ireland were controversially defeated 5-4 on penalties by the Netherlands in their quarter-final clash after Cherry Orchard youngster Corcoran received his marching orders – a second yellow – for leaving his line before saving the fifth Dutch spotter. Oranje star Daishawn Redan was subsequentially awarded a second opportunity to convert his penalty, and fired past Irish defender Oisin McEntee between the sticks to send his side into the semis. The incident led to widespread criticism of Czech official Zbynek Proske, who was confronted by Ireland senior manager Martin O’Neill as the Dutch celebrated their progression. Corcoran, however, suggested this evening that Proske had made the correct decision, and called for his generation of boys in green to emerge all the stronger from their heartbreaking European exit. “As the dust settles on last nights [sic] events I would like to thank everyone for there [sic] support,” Corcoran wrote in a statement posted to Twitter. “My team mates, friends, family and so many in the sporting world have been in unbelievable. Now it’s time to accept that although as cruel a blow as it was, the decision was correct and we will move on and learn from it to become stronger. Email “'The decision was correct': Ireland U17 'keeper grateful for support after cruel Euros exit”. Feedback on “'The decision was correct': Ireland U17 'keeper grateful for support after cruel Euros exit”.